The big question: how to overcome perfectionism? I've never been comfortable around people who don't suffer fools gladly - like my cover's going to be blown or something. Maybe you don't suffer "fools" gladly, even (especially?) when you feel yourself to be one. Perhaps you're prone to perfectionism, hence your interest in this piece. Quite rightly, you sometimes think, you want the best in all things at all times, which superficially sounds reasonable, right? Presumably, you also want the best for your mental health, too. If you really are a perfectionist, you've probably already found it troublesome; possibly even a deal-breaker in some instances - a royal road to disappointment and anguish, not to mention impaired relationships. But why is it wrong to strive for perfection? After all, if we shoot for the stars, we might land on the moon, right? Why would you even want to overcome perfectionism, to rise above the sloppy masses? Oh, come on! You're way ahead of me. It's not the worthy striving for excellence that's the problem, it's the distress caused by perceived failure that's so undermining. 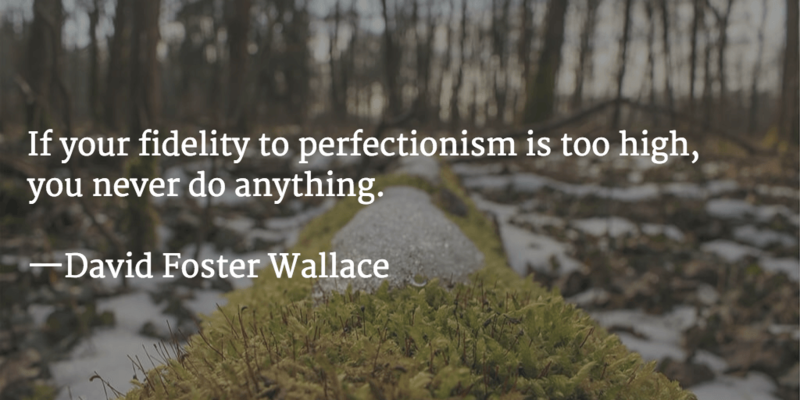 The unpalatable fact is that perfectionism makes for less effectiveness, not more. One reason is that perfectionists blithely throw the baby out with the bathwater (or, as we'll see, the tennis racket into the net) more often by quitting earlier if perfection isn't immediately forthcoming. Perfectionists also tend to procrastinate, because there's an understandable unwillingness to begin projects knowing you'll feel overwhelmingly pressured for them to be absolutely perfect. 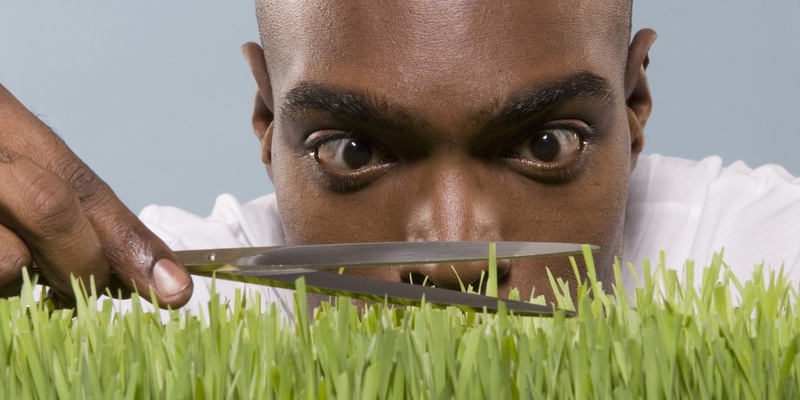 All this is bad enough, but what does perfectionism actually cost you in terms of well-being? There you are, exit baby with said bathwater. One of the first definitions of perfectionism was: "The practice of demanding of oneself or others a higher quality of performance than is required by the situation." A phobia of making mistakes! This is how Craig described his attitude. Perfectionism is screwing up my life and relationship! I was a child perfectionist - if I made one mistake in schoolwork, it was never good enough to just erase it; I had to rip up the whole sheet. I was running the New York marathon recently and it was clear I wasn't going to beat my best time, so I just stopped - even though it was for charity. Relationships tend to be damaged because the poor ones who enter the orbit of the perfectionist may come to feel bullied, enslaved by the demands of what they perceive to be a chronic control freak. The perfectionist may not intend to bully, but bully they do. Craig described how his lack of flexibility in the standards he imposed upon himself and others had "ruined" his life. How relationships had floundered as partners couldn't take the pressure of his impatience and intolerance. How he'd started, then abandoned, all kinds of activities, even when others said he had talent. The fact is that, for the perfectionist, just about everything ultimately leads to disappointment, which is profoundly depressing. Nothing is ever really good enough. Even victories and other successes can be seen as imperfect and mistake-ridden: Sure, I won, but I could have played better! It's the inflexibility that's a problem. Seeing imperfection all about and constantly crashing against the rocks of harsh reality isn't too great for self-esteem or relationships, it's clear. But it also seems that perfectionism can be positively bad for your mental health. Another definition states perfectionism to be a pathological pursuit of usually unobtainable high standards that is strongly linked to anxiety, depression, and eating disorders. A pathological concern with wanting to be perfect can lead to worry, regret, fear of the future (with all its possible failures)...no wonder it seems correlated with depression. If a tendency for perfectionism might be an indicator of vulnerability to depression and other psychological conditions, then we can presume that overcoming perfectionism may help protect us from poorer mental health. The first step to overcoming perfectionism is to truly understand it. But surely being a perfectionist can't kill you, can it? Overcome perfectionism and live longer? Some research in 2009 also linked the trait of perfectionism to increased likelihood of premature death! Presumably because of the massively increased stress perfectionism inflicts. So, overcoming perfectionism may help not only your mental health, but also your very physical survival. One of the tyrannies of perfectionism is the way that it narrows focus to all-or-nothing levels; this has consequences. No middle ground - but reasons for hope. A perfectionist will see reality in simplified all-or-nothing ways. There is perfect and then there is useless. No gradation. Good enough doesn't tend to figure. This overly simplistic black-or-white perception is also a characteristic of depression, anxiety conditions, and eating disorders such as anorexia and bulimia; hence the seeming correlation with these conditions. Perfectionism is built upon a pile of assumptions as to how the world works - or rather, how it should work. Where do these assumptions originate? Where does perfectionism come from? You had hyper -critical or demanding parents. Your parents/teachers were quick to point out your mistakes; slow to give credit. You had parents or other relations who placed huge expectations on you and seemed to value you purely through your achievements. Your parents had perfectionist standards for themselves. You had no or little parental approval or even any feedback at all and therefore have no yardstick to tell whether what you do is ever good enough. 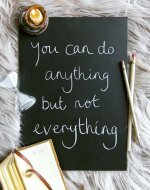 But regardless of why perfectionism arose, these tips will help you achieve more by actually caring less and seeing the bigger picture. When you don't sweat the small stuff or the big stuff, then life becomes more exciting, rewarding, and adventurous. When you approach a staircase, you don't leap the whole flight in one bound. Don't then expect to win or succeed straightaway. Craig's childhood perfectionism didn't allow him to see coming second to an older boy in his tennis final as relative success, a vital step on the way to greater things. He'd expected to bound up the whole staircase in one. 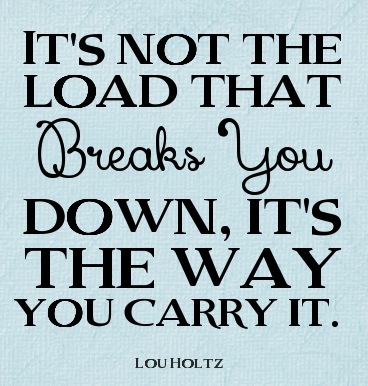 Cut back on things that need to be perfect. Is it really vital to have every CD in your collection perfectly aligned or all your books spaced exactly evenly from one another? Being a perfectionist and inflicting that on others is really a way of trying to control people. People don't like feeling controlled or coerced all the time, even if you do know best. Remember people are who they are, regardless of how you feel they should be. What makes us human are our foibles and, yes, weaknesses. Don't be an unintentional bully. Learn to think in gradations: Do you really think anything less than 100% is zero? Over-simplified all-or-nothing thinking isn't a perceptive, sophisticated, or accurate way to evaluate much of life. The brightest people can do the dumbest things sometimes; most things are relative. Save your black-or-white thinking for the really simplistic situations of life (such as whether to jump from the path of an upcoming juggernaut!) Recognize what's good enough and move on. All dictatorships hate humor - Hitler famously had stand-up comics banned. Ahem. I'm not comparing you to him, of course, but my point is that humor is flexible in that it enables us to see beyond rigid, fixed viewpoints. Often, perfectionists fail to see the funny side. If you are a perfectionist, you may have even been accused of a sense of humor failure on occasion. A ready sense of humor depends on being able to shift perspective quickly, which is essential when things don't work out exactly as you'd hoped. Hang out with and learn from funny, relaxed people. Who was it that said: "Life is too important to take seriously?" Tip 5: Remember mistakes are not catastrophes. Well, not usually! Be brave and accept that mistakes happen and, let's take it further, that they should happen. Not making mistakes means never having the opportunity to truly learn and develop. In some contexts, mistakes can even be encouraged so we can move beyond them more quickly. Learning music requires lots of mistake making (at least in my imperfect experience). Only fear mistakes if you are a bomb disposal operator or a parachute instructor. Because making mistakes isn't a mortal sin (in fact, some ancient cultures felt that perfection was a sin because it displayed hubris and challenged the gods), don't fear mistakes or use the possibility of imperfection as an excuse not to start things. If a journey is worth making, then false starts and temporarily getting lost matter little if the final destination can still be achieved. This is as silly as someone doing one nice thing and you proclaiming them to be a total saint. Psychologists call this "globalizing" and it's a hallmark of intolerance. People with low self-esteem, for example, are intolerant of themselves. As I said, intelligent people do dumb things, but are still generally bright. Decent people may occasionally be less than kind, but are still generally good people. Shooting people on the spot for minor transgressions is the kind of thing that happens in barbaric concentration camps; it doesn't need to be a strategy you employ. Ultimately, perfectionism produces a chronic fear of failure and this comes about from failure (yes, I get the irony) to see success as relative. Need more help to overcome perfectionism?